Rapportive, a startup that looks to make Gmail better by providing contextually relevant information about your contacts, has raised an impressive seed round of over $1 million with participation from some well known angels. The full list: Gmail creator Paul Buchheit, Scott Banister, Jason Calacanis, Gary Vaynerchuk, David Cancel, Dharmesh Shah, Shervin Pishevar, and Roy Rodenstein. Also participating are Dave McClure’s new fund 500Startups, Nivi & Naval Ravikant’s VentureHacks, Charles River Ventures, Kima Ventures, Zelkova Ventures, and BOLDstart Ventures. Rapportive has also announced that it was part of the latest batch of Y Combinator companies — CEO Rahul Vohra says that YC’s Paul Graham has described the round as “stunning”, and that it’s in line with his prediction on how funding rounds will be done in the future, with mass-syndication, and no fixed amounts, closing, or lead. 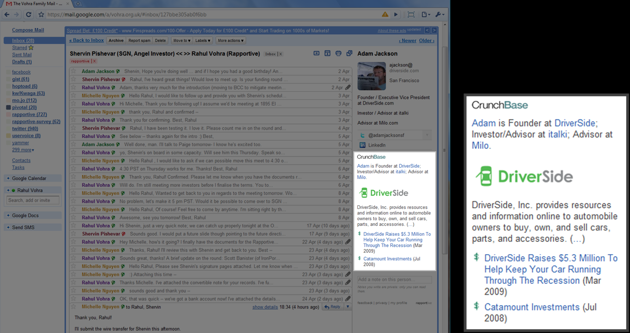 Rapportive uses a browser plugin to display information about your contacts in Gmail’s sidebar (it replaces the ads). This includes information like a profile photo, occupation, and links to their social network presences. The company says it will use the money to hire, improve its existing product, and to expand to other email platforms (in other words, this won’t be Gmail-only in the future).